Cooking a Thanksgiving meal involves more than just mixing, creaming and baking. It's a logistical feat worthy of a project manager, from figuring out which side dishes to cook first to how long the turkey will occupy the oven to making sure the food is warm at meal time. If there's a way to simplify that process, we'll take it. According to Instant Pot fans, the popular kitchen tool is the way to simplify Thanksgiving. 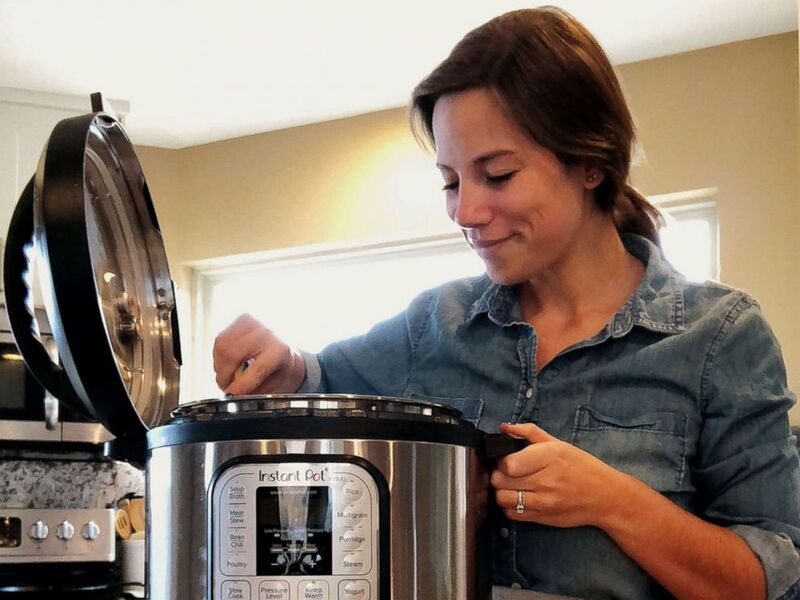 "For big family meals like Thanksgiving, the days are chaotic and there's a lot of dishes using up kitchen space," said Brittany Williams, who shares Instant Pot recipes on her blog, InstantLoss.com. "The Instant Pot is just like an extended kitchen cooker where you can put it on a counter out of the way and set your food inside of it and you don't have to babysit it." Brittany Williams started the blog InstantLoss.com after losing 125 pounds by cooking with the Instant Pot. "The Instant Pot can really do anything," she said. Williams, a mother of three, lost 125 pounds by cooking healthy meals at home in her Instant Pot and wrote a cookbook, "Instant Loss Cookbook." She said the multi-cooker -- which costs around $100 and can do the job of everything from a slow cooker to a steamer and more -- is also great for making healthier versions of Thanksgiving favorites, or just making smaller portions of your favorite indulgent dishes to enjoy in one sitting without any leftovers. Skinnytaste.com founder Gina Homolka, who wrote an entire book, "Skinnytaste One & Done," on easy meals using tools like the Instant Pot, said an entire Thanksgiving meal for a group of four or less can be cooked in the Instant Pot. 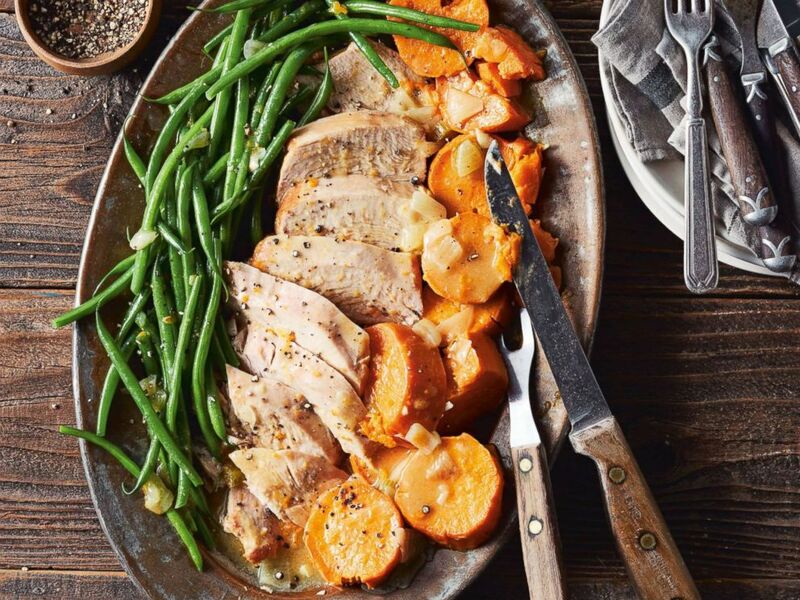 Turkey breast with sweet potatoes, green beans and gravy are pictured from the cookbook "Skinnytaste One & Done" by Gina Homolka. "You can make the turkey, the gravy and the sides all together in less time it would take to cook in the oven, without more dirtying pots and pans for all your side dishes," she said. "And since it cooks in half the time, that leaves more time for fun." Both Homolka and Williams agree that for groups of more than four people, it's best to cook the turkey in the oven because of both size and presentation. Use the Instant Pot for side dishes and desserts, they said. "The Thanksgiving turkey is usually roasted in the oven so you get that beautiful color, and you're not going to get that with the Instant Pot," Williams said. "If you're looking for your classic Thanksgiving bird, that's the only thing I wouldn't do." Read below for Williams' guide to cooking Thanksgiving side dishes in an Instant Pot, and recipes from both Williams and Homolka. Two days before Thanksgiving: Make the pies and store them in the refrigerator until ready to eat. One day before Thanksgiving: Make side dishes including creamed corn, green beans, cranberry sauce and yams. Thanksgiving Day: Make the mashed potatoes, because those are best eaten soon after they're blended. 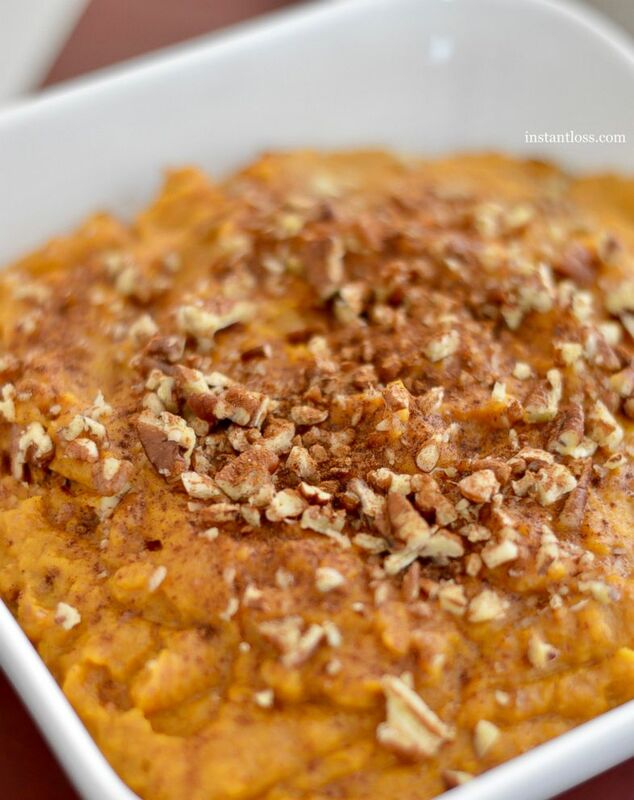 Brittany Williams shares a recipe for candied yams on her website InstantLoss.com. Williams' recipe for candied yams relies on the natural sweetness from the maple syrup and sweet potatoes instead of added sugar. "These candied yams are absolute perfection, and you will be left with people asking for more," she said. 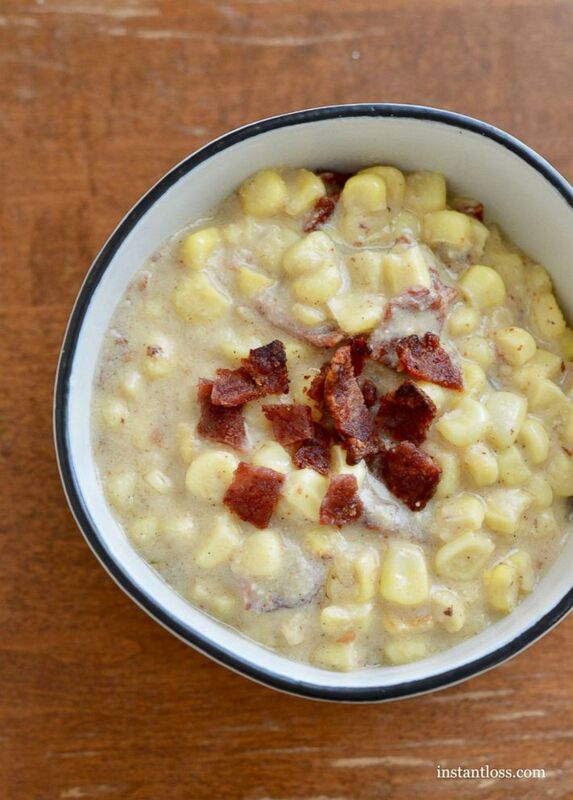 Brittany Williams shares a recipe for dairy free creamed corn on her website InstantLoss.com. Williams said this recipe is her favorite Thanksgiving side dish. It uses cashews to create the creamy consistency instead of cream cheese. 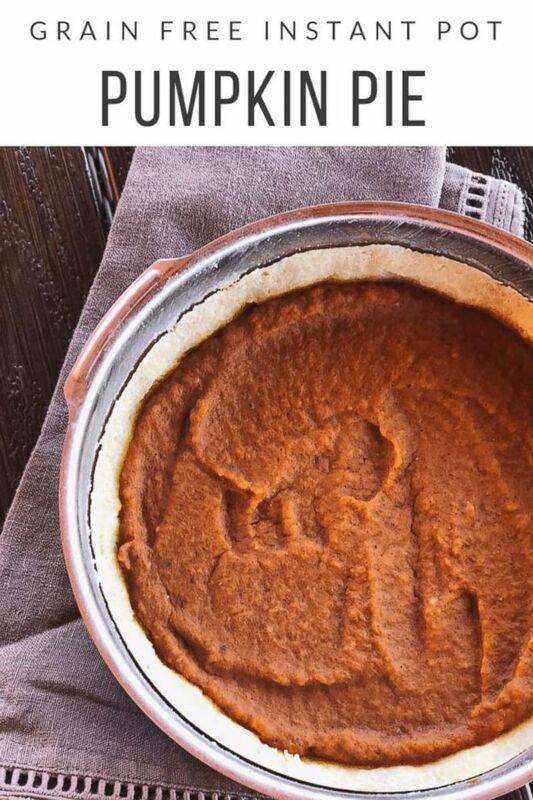 Brittany Williams shares a recipe for grain free pumpkin pie on her website InstantLoss.com. Yes, you can make pie in the Instant Pot. Williams' recipe requires fewer than 10 ingredients. "This recipe is as simple as it sounds -- maybe simpler," she said. 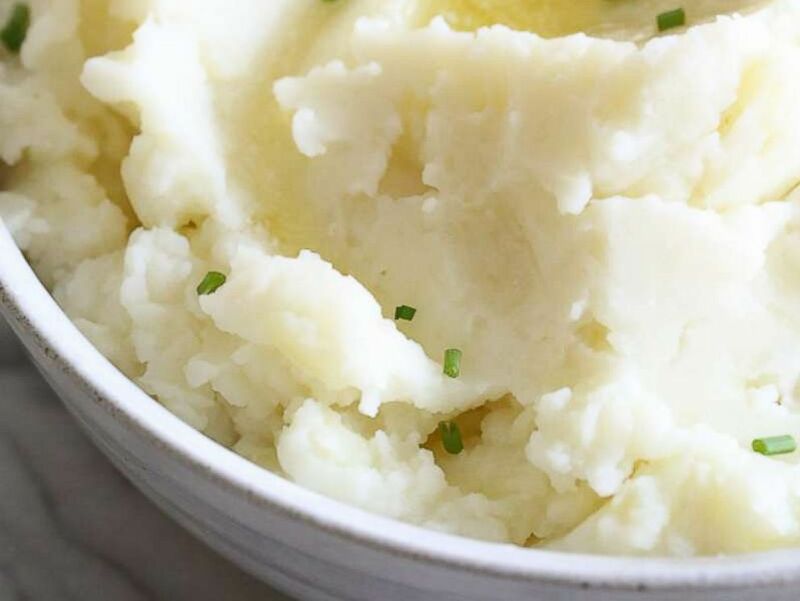 Instant Pot mashed potatoes by Skinnytaste.com are pictured here. Mashed potatoes take just 10 minutes to cook when made with an Instant Pot, according to Homolka. This recipe from Skinnytaste.com delivers creamy mashed potatoes made with russet potatoes, low-fat buttermilk and sour cream. Homolka shared this all-in-one recipe from her book, "Skinnytaste One & Done." This is a complete Thanksgiving meal for four people cooked entirely in an Instant Pot. Season the turkey breast with the salt and pepper to taste. Press the sauté button on an electric pressure cooker (6- or 8-quart is the ideal size). Spray the pot with oil. When hot, add the turkey breast and cook until browned, 2 to 3 minutes per side. Transfer to a plate. Add the butter to the pot and let it melt. Add the onion, celery, and garlic and cook, stirring, until the onion is softened, 4 to 5 minutes. Stir in the flour and cook, stirring, until the mixture is golden, 30 to 60 seconds. Stir in 1 cup of the broth, using a wooden spoon to scrape up any browned bits and smooth out any lumps. Add the remaining 1 1/4 cups broth, 1 cup water, the carrot, sage and bay leaves. Return the turkey to the pressure cooker. Arrange the sweet potatoes on top, cover and cook on high pressure for 10 minutes, until tender. Let the pressure release naturally for 10 minutes, then quick release. Open when the pressure subsides. Transfer the turkey breast to a cutting board. Using a slotted spoon, transfer the sweet potatoes to a serving platter. Loosely tent each with foil. Discard the bay leaves. Press the sauté button. When hot, add the green beans and cook, stirring occasionally, until crisp-tender, about 8 minutes. Discard the skin of the turkey, slice and arrange it alongside the sweet potatoes. Spoon the green beans and gravy onto the platter and serve. Reprinted with permission from Skinnytaste One & Done. Copyright © 2018 by Gina Homolka. Photographs copyright © 2018 by Eva Kolenko. Published by Clarkson Potter, an imprint of Penguin Random House, LLC.